Duri Rejuvacote Nail Growth System (Base / Top coat) -- I probably sound like a broken record, but this is the BEST base / top coat I've ever used and I don't use anything else... ever. 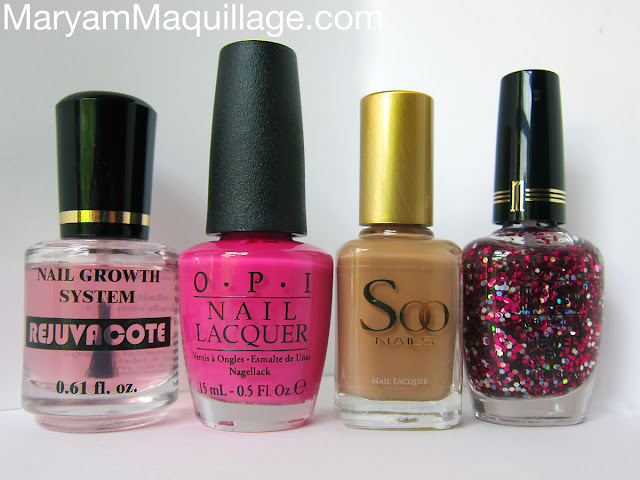 Apply your base color (pink) all over your nail on top of your base coat and let it dry. If you have the skills, use a fine nail art brush to paint a crescent shape at the bottom of your nail instead of painting the whole thing. I went with the crescent method because I was in a hurry and needed faster drying time, plus I didn't want bulky layers. 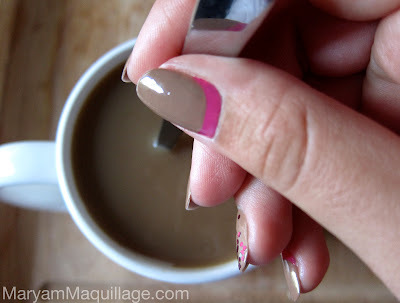 Taking your brown or coffee colored nail polish, paint directly on top of the previously applied color starting 2-3 mm above the root of the nail. If you did the crescent technique, start your brown color right above the pink. You can perfect the line and shape easily with the brown. For the accent nail, use the Milani Jewel FX glitter polish to add a few coats of glitter. Start the first coat by covering the entire nail, the second coat from the center, and the third (optional) just from the tip to create a glitter gradient. Finish the manicure with your top coat. Oh superbe manucure, c'est trop beau ma cherie. Love your twist on the ruffian manicure! your nails look eatable jahaha!! Very pretty mani and the color combo looks just great! Delicious, yoummy!! :P Loving it! DYING over this nail art. I absolutely love that raspberry color. BEAUTIFUL (!!!!) nail design and so imaginative! Brown is a hard nail color to rock and of course you find a way to make it look amazing! I just bought a new orange nail polish that is gorgeous on it's own but I'd love to see some funky nail designs if you have any in mind. Goodness I miss blogging, never going to take a break like that again! You're amazing Maryam! I really love the nail polish & it came out beautifully on your nails! Wish I could do this! Your nails look amazing!! Oooo, now I want ice cream! Super cute! I love pink and brown together :)) you're right, there's just something edible about it... actually, this design is super simple, I'm sure you can do it. It's just like painting your nails with a single color, you just do it twice!! I don't like brown on my self, but this nail art is fantastic! You are THE BEST! cool i will try this! So pretty! I want to do the half moon mani but i haven't gotten the chance. <3 Gorgeous, creative and...strangely delicious looking. great nails!!! love it ! what if we follow eachother? Great blog!I just found it!!! I made a blog a couple of months ago too! sublime, j'adore. Ca me fait penser aux cupcakes, pourquoi je ne sais pas.. lol en tout cas c'est magnifique! i LOVE This! Thank you so much for posting on beautylish and I was able to follow you! If you can check out my site too thanks! !